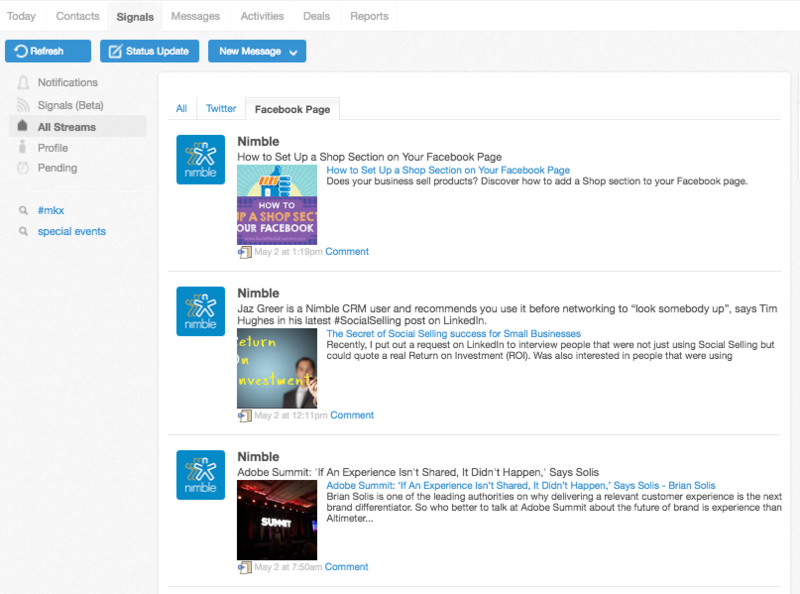 Nimble supports Facebook Pages that are connected to your Facebook accounts. Please Note: Due to Facebook's API limitations, Nimble cannot import and track Facebook fans. Also, our integration only supports 1 Facebook Page connection at a time to Nimble. 1. In Nimble, go to Settings >> Networks & Imports and choose "Social Networks"
2. Make sure the Facebook account (where your Facebook Page is linked to) is already connected to Nimble. 4. Nimble will return all of the Facebook Pages you are the administrator of, which you can connect to Nimble. 1. In Nimble, go to the Signals tab >> "All Streams"
2. You will see a tab displayed called "Facebook Page"
3. Click on it and you'll find the stream for this page.